Imagine my surprise...I'm looking over the clearance candy at CVS Pharmacy and I see this bag of "England's Best Hard Candy" sitting among the other unsold candy misfits. Clearly this must be a mistake I say to myself, if this is England's BEST candy, how can it be here with the candy misfits?!?! I grabbed the bag from the shelf and eagerly took it home to sample the best hard candy from that friendly country across the pond. Okay you say, is this really England's Best candy? Well, the last article I read said that the Mars bar, or as we know it in the states a "Snickers with Almonds", is the bestselling candy in the U.K. So what I can tell you is that this probably isn't England's Best candy, the name is likely a marketing gimmick. (My personal opinion is that the Cadbury Wispa is England's best, no, the world's best candy :-P ) However, this candy is in fact made in England, but is distributed by CVS Pharmacy Inc. in the U.S. I couldn't resist buying this candy because of the name. I love products with names like "England's Best". It is very clever marketing to Americans who seem to loves things that come from far away. All joking aside, this really wasn't as horrible a candy as I thought it might be. 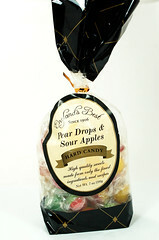 Pear and Sour Apple are two of my favorite flavors, so it's hard to impress me when I've had a ton of pear and sour apple flavored candy in my lifetime. 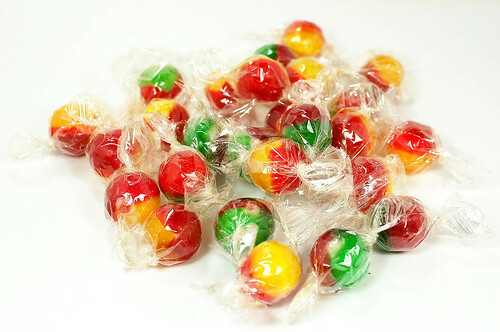 The red and green colored candy was sour apple and the red and yellow colored candy was the pear flavor. The sour apple was fruity with a nice flavor and was only slightly sour. What I liked best about this candy is that it wasn't very sweet at all. Sometimes with hard candy, I feel like I need to drink an entire glass of water to help rinse the sugary sweetness out of my mouth, not so with this candy. The pear flavor was also nice and fruity with a light pear taste that was somewhat flowery and sweet. This wasn't a ripe juicy pear flavor like a Jelly Belly, it had a nice hint of pear flavor to it though. This candy had an excellent crunch to it, which is true of most candy made of sugar that has been boiled to 300F. I ended up putting England's Best candy in the candy jar passed down to our family from a Great Grandmother. The colors look amazing sitting in the white milk glass candy dish. This is not a bad candy to eat, but I'd rather set it out for decoration and for others to enjoy. This isn't a weekly candy staple, but I'm always ready to try something new, especially with such an interesting company name on the label.